Payne, Matthew T. “Marketing Military Realism in Call of Duty 4: Modern Warfare,”Games & Culture 7.4 (July 2012): 305-327. This essay investigates the challenges that video game marketing encounters when selling the pleasures of playing virtual war. While marketing paratexts are crucial to video games because of the vagaries of their industry, they are especially important for Call of Duty 4: Modern Warfare, as it is the first of the franchise to be set in the 21st century and immerse players in contemporary theaters of war. 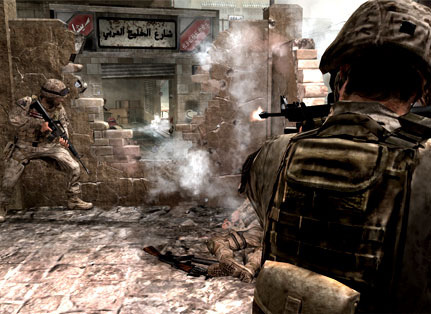 These marketing paratexts not only generate hype for the game and work to drive sales, but as importantly, they also suggest particular textual readings over others with the goal of insulating Call of Duty’s virtual war play from interpretations and criticisms that might link the violent play on-screen to the worldly violence unfolding in Iraq and Afghanistan.